An aerial photo taken on June 2, 2018 shows speedboats on the Baiyangdian Lake. ON April 21, a master plan for the development of Xiongan New Area was published, setting overall development goals for the area by 2035 and 2050. It is considered a blueprint for China’s high-quality development in the new era. The plan states that ecological protection and green development are the main priorities: an overall arrangement of production, living, and ecological restoration shall be made; balanced urban-rural development shall be achieved; infrastructure and public services shall be improved; attention shall be paid to the density of urban construction and population, while the water environment shall be protected. In its first phase Xiongan New Area covers about 100 square kilometers. In a departure from traditional modes of urban development which see the expansion of a city from its center, Xiongan will consist of three sections to avoid the over-concentration of resources and population in one central area. The north section will include five urban groups. The central area, which used to be fertile arable land, will be restored and better utilized. The south area is adjacent to the Baiyangdian Lake, so special attention will be paid to ecological impacts on this area during the development. An area of about 20-30 square kilometers in the starting area will be selected for Beijing’s non-capital functions. High-end and high-tech industries will be developed in the five urban groups – Xiong-xian County, Rongcheng County, Anxin County, Zhaili Town, and Zangang Town. In an area that covers about 50 square kilometers, villages will be developed which feature a pleasant living environment, sound infrastructure facilities, and good public services. According to Zhu Ziyu, chief planner at the China Academy of Urban Planning and Design (CAUPD), all these urban groups will be surrounded by forests, wetlands, and green-clad lands, and each urban group features complete infrastructure and public services that can meet the needs of its residents for work and life. “The plan doesn’t determine everything in the very beginning, so it can be adjusted according to practical needs and development in the coming years,” said Li Xiaojiang, a member of the expert committee advising the coordinated development of the Beijing-Tianjin-Hebei region. An aerial photo taken on June 2, 2018 shows the Xiongan New Area citizen service center. The buildings of Xiongan New Area will utilize features of Chinese architecture. According to the plan, the city will be a perfect blend of both Chinese- and Western-style architectures – possessing modern and ancient elements. Skyscrapers can only be built in designated areas, serving as headquarters for financial institutions and enterprises. The city will not have cement and glass walls everywhere. “With a beautiful skyline, the city should not give a feeling of pressure with a high density of skyscrapers and high-rise buildings,” said Zhu Ziyu, who pointed out that the architecture should be classical and modern, bearing a simple but elegant style. Considering its flat terrain, the new area will be built into a square city featuring a symmetrical structure with street blocks that resemble a chessboard. The north-south axis connects historical and cultural sites, as well as natural scenic areas. The east-west line connects the different urban groups. The new area is expected to be surrounded by green paths and waterways, with parks dotting the entire area. “The cultural inheritance has been highlighted. When making new constructions, old trees, memorial arches, and old architectures will be kept, allowing local people to visit and cherish their memories about the city,” said Chen Gang, vice governor of Hebei Province and director of the Xiongan New Area Administration Committee. The plan explicitly states that local history and culture will be protected. The new area will keep traditional elements while incorporating new and modern ones. Old trees and memorial arches will be included into newly built parks and urban green areas, achieving a harmonious combination between urban construction and history and culture. Cultural sites, historical towns, and traditional villages will be well protected, allowing both local residents and tourists to appreciate the history of the city. So far, over 100 high-end and high-tech enterprises have set up branches in Xiongan, accumulating resources for innovation. The plan for Xiongan development also proposes to take the lead to deploy blockchain, terahertz, cognitive computing, and IPv6. The plan says that Xiongan will be the location for Beijing’s non-capital functions. It will attract elements and resources for innovation and develop high-end and high-tech emerging industries, establishing a modern industrial system featuring coordinated development of real economy, technological innovation, modern finance, and human resources. What is worth mentioning is that the plan sets 38 key targets to build Xiongan into a smart city. “Such targets include having more than 90 percent of its infrastructure categorized as smart, and providing high-speed Internet up to 1,000 megabits per second for residential houses and 10,000 megabits per second for enterprises,” said Wu Hequan, an academician with the Chinese Academy of Engineering and deputy head of the expert committee advising the coordinated development of the Beijing-Tianjin-Hebei region. Wang Dongfeng, secretary of the CPC Hebei Provincial Committee, said that one of Xiongan’s missions is to provide a model of high-quality urban development for other cities in China, and to explore replicable experience. High-end and high-tech will be the most significant features of the new area. 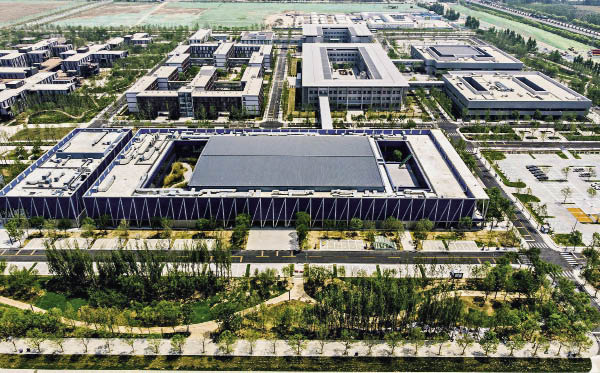 Xu Qin, governor of Hebei Province and deputy secretary of the CPC Hebei Provincial Committee, emphasized that Beijing will move some of its functions to Xiongan New Area, along with some universities, enterprise headquarters, financial institutions, and government-affiliated institutions. As a result the area will become a base of new-generation information technology, modern life sciences and technologies, new materials, high-end modern service industry, as well as green agriculture. Reform and innovation is the soul as well as the primary driving force for Xiongan’s development. According to the plan, Xiongan New Area will guarantee convenient public services for both enterprises and residents in terms of land use, tax, finance, human resources, and opening-up, and make preferential policies to facilitate innovation, thus ensuring the newly relocated enterprises and residents can stay and thrive. The new area will strive to build first-class technology and innovation platforms in the world, with first-class universities and education infrastructure to foster talents and innovative policies and mechanisms to serve local firms and people. “The new area will be built into a smart city, with a digital version of the city being built simultaneously with the physical one,” said Liu Duo, president of the China Academy of Information and Communications Technology. The plan says that the new area will build itself into a leading digital city with intelligent infrastructure and a management system for big data assets. There will be a digital-physical city system that allows decisions to be tested in a simulated Xiongan before being implemented on the ground. According to the plan, a smart Internet of Things platform will be established. By utilizing new technologies such as cloud computing, the city will be able to monitor and analyze the use of public resources to improve their allocation and facilitate people’s lives. This April marks the first anniversary of the establishment of Xiongan New Area. Workers are planting trees in Zangang Town. About 70 percent of Xiongan New Area will be covered by trees and water. The new areas will be dotted with parks in suburbs, downtown areas, and residential communities, allowing its residents to enjoy a close-to-nature life by having access to green-clad parks only a few minutes’ walk or drive away. The roads and streets will all be tree-lined. 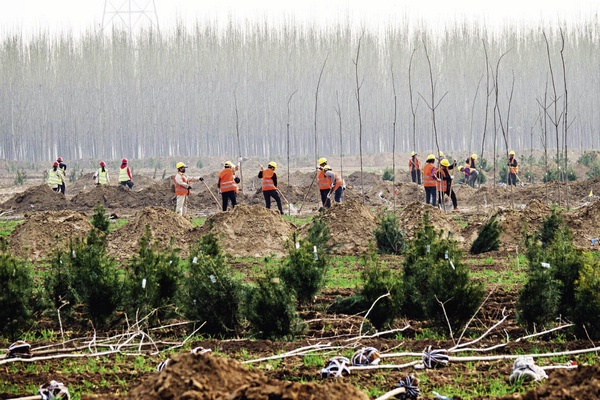 The plan states that the forest coverage rate in Xiongan will reach 40 percent. 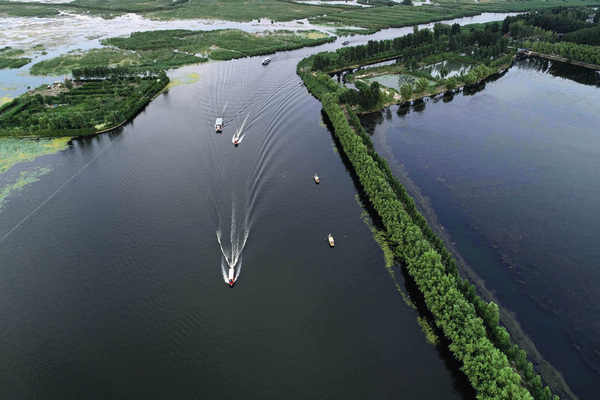 “There are no other big cities where vegetation and water cover 70 percent of the total area as planned in Xiongan,” said Wu Hequan, who believes the city will resemble the beautiful scenery in a traditional Chinese painting where the town is nestled close to trees and lakes. “Equal attention will be paid to regional development and environment improvement, and flood control projects will be carried out. Baiyangdian has been dubbed the ‘kidney’ of North China and its many ecological functions should be maintained,” said He Lifeng, director of the National Development and Reform Commission. Green belts will be constructed around the Baiyangdian Lake and the entire Xiongan New Area. Green corridors will be set up along major rivers and avenues. Nine forest patches will be constructed among urban groups and in ecological conservation areas. “By utilizing such facilities as rain gardens, sunken gardens, and wetland eco-systems, the new area can save and recycle 100 percent of the rainwater, so that the collected rainwater can be used for plants, avoiding water logging in the city and contamination of underground water, as well as saving fresh water,” said Gao Junhai, an expert with CAUPD. The Xiongan plan emphasizes green, smart, and innovative development by promoting a green and low-carbon way of living, and urban construction and operation. Advanced environment-friendly and energy-saving materials and techniques will be widely used in the construction of the new area. The plan says that the construction of the new area will be people-centered, with efforts being made to improve people’s lives, construct high-quality infrastructure that can be shared by all, and improve public services, in order to make the new area a livable and sustainable modern city which is attractive to new residents and enterprises. The new area features three levels of public services, targeting needs of the city, urban groups, and residential communities. The new area aims to be pedestrian-friendly with a goal that leading modes of local transport will be buses, bikes, and walking, and convenience stores, kindergartens, elementary schools, middle schools, clinics will all be within a 15-minute walk from homes and workplaces. High-quality educational and health care recourses will be introduced and evenly distributed. Trains from Xiongan will take only 20 minutes to reach Beijing’s new airport, and 30 minutes to reach urban Beijing and Tianjin.